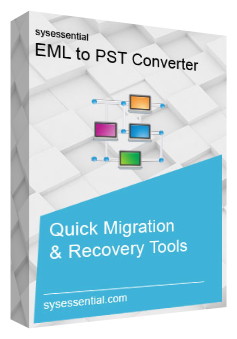 EML to PST Converter Explore Salient features Now! The application is full-fledged in functioning. It is a smooth software application that makes swift data export from EML files into PST file format. Thus, there is nothing to get troubled at any point. It will smoothly convert all the emails from EML file format into PST file format. It uses latest technologies and this leads to convert entire data from EML file format into NSF files. This will add ease at user’s end and will increase benefits for users. It is one of the best utilities to be used because it is supportive of working with all the MS® Outlook editions such as 2013, 2010, 2003, 2007 and several more. This is a convenient feature because in most of the cases, version specific applications create complications. Sysessential for EML to PST Converter is a program that provides facility to users to save the converted data into a separate folder. This will create an ease because this way, users can access the emails in new folder and whenever users feels the need to access data, they just need to open that specific folder and have the data for further tasks. If you are using the software and feeling apprehensive then we assure you to keep aside all the worries because application is fully features and safe to work with. You will not come across any complexities ever. Though the technologies are advanced but as the same time comfortable to work with. Even you have little technical knowledge; you won’t feel terrible with the tool. It offers easy UI so not to worry. Software engineers assured for complex-free data migration. The application is fully capable for exporting emails from EML file format into PST files of Outlook. Due to high advanced technologies, users never feel uncomfortable when it is to run the tool. Just as software is supportive of all Outlook editions in the similar manner, application works smoothly with all the Windows OS editions. You can operate the tool without bothering the version supported. One of the fastest applications from Sysessential. Run the application and it will migrate unlimited EML files into PST file format. It usually converts data in few minutes or else say in few easy steps. Will software executes complete data migration or just the few files? The abilities of the application are high. By installing the application, you will realize how competent the application is when it is to convert bulk EML files into PST file format. However, if you are not interested to move all the emails from EML files into PST then you can choose the selected emails for migration and continue with selected data migration task rather than all. How safe it is to install the application? During the course of software creation, we as a software development company, always ensure to provide safe solution to users. This is the reason, company assures for adding all peculiar safety measures. It is fully protected utility that won’t affect conversion process at all. What are the prerequisites to be kept in mind while using the software? You can run the application if MS® Outlook is installed onto your machine. Otherwise it won’t be able to employ EML to PST Migration successfully. What are the benefits with the application at user’s end? The application instilled with lots of advantages such as fast working techniques, swift data migration, selected email migration, saving data into new folder, superior working techniques, simple data export techniques, use simple conversion methods and easy user-interface altogether make it a beneficial utility as compared to others. How software is separated from other available contemporary software applications? Sysessential for EML to NSF Converter is an ace software solution amongst the available conversion solutions. By downloading the application in free of cost trial run, you will know the software’s functions and working procedure. It is a distinguished in the sense of rich features, working procedure and lastly cost. It is fortunate that application costs just a nominal price. What freeware demo version is capable of? The free of cost demonstration run of the application supports for showing the complete features. You will catch the glimpse of export of first 10 emails from EML file format into PST file format. This small conversion gives you an idea about working of the tool and help in testing the level of excellence with the tool. Thunderbird is a known emailing application but due to latest and expert features in Outlook, I decided for using Outlook. before commencing swift from Thunderbird to Outlook, I want to move away all the emails into PST files of Outlook. I tried for freeware demo run but it was not worth to use. Then I decided for Sysessential for EML to NSF Converter and I was so right, as application has moved all the emails from Thunderbird into NSF file format. After falling into the need where it is utmost important to access EML files into PST, I decided for purchasing Sysessential for EML to PST Converter and found application suitable to fulfill the needs. The software is up to the mark performance provider and leads to yield quality solutions ahead. I am proud on the company for producing such a beneficial utility for bulk data migration.